Why did I want to get PMP® certified? To date, I am working in a Software company and mainly involved with the development of software. I am also involved in leading and managing team for reaching the objectives. 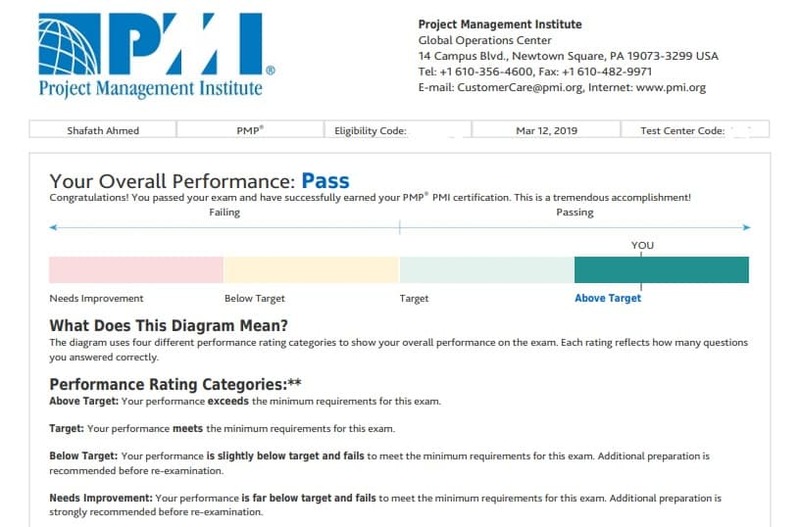 One of the main reason I wanted to get PMP® certified was to gain formal knowledge in project management. I didn’t want to reinvent the wheels while managing projects. I wanted to know the logical steps associated with the management for the project success. And, after all this, I must say, I loved the PMP® course contents which actually helped me to understand the logical steps and score Above Target. How long did it take to get PMP® certified? It took me 4 months to complete the journey. I started the journey with training in November 2018 and ended up giving exam in March 2019. What did my study plan look like? How often and how long did I study per day? I studied around 2-3 hours per day but increased the study time to 6-8 hours for the last 10 days before the exam date. What study materials did I use? PMBOK® guide is the ultimate source for study. I read the whole book twice and spent my time in understanding the concept of each topic. Besides, I bought Rita Mulcahy’s book on PMP® exam prep and read it once. I took my training from PMaspire Ltd at the beginning of the preparation. Mr. Abdulla and his team from PMaspire did a great job to give me self-belief and confidence for taking the preparation of exam. I bought the exam simulator from PMaspire and ensured I give all the mock exams to get sense of the questions and cover each concept. At last, gave two/three free mock tests that I found in online just before the exam date. What was the biggest struggle when preparing for PMP® exam? The biggest struggle was to find the time for study. I was involved in a full time job. I have a wife and a baby of 11 months old who was learning to walk. I had to stay focus and had to wake up early in the morning to study when everyone is sleeping. I shuffled all other priorities and put PMP exam preparation at first. Tips and tricks for someone who is currently going through this certification journey? Study and practice. There is no shortcut. In the actual exam, I faced a lot of situational questions and looked like more than one answer can be true. Without understanding the concept, it would have been very tough to mark the correct answer. For the ITTOs and process, do understand what is the main purpose of each process. What are the main inputs, What are the main outputs. E.g Control Quality process main input is Deliverables and main outputs are Verified deliverables, Quality control measurements and Change requests. Its main purpose is to monitor the results of executing quality activities to assess performance and recommend corrective changes. 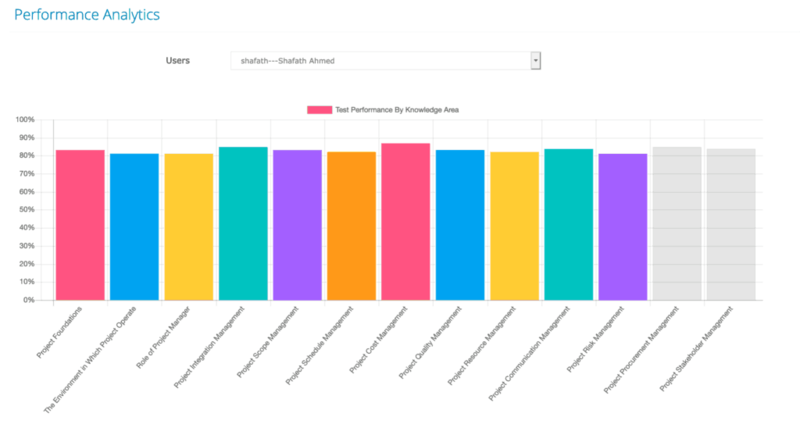 And, don’t forget to give tests in simulator to experience real exam feel and to identify your missing knowledge. Getting good marks in simulator test will give you confidence for the exam. Walk through actual exam date. How did I find the actual exam? I stopped studying from the previous day evening of the exam. Excitement and nervousness were there but had to remain calm. Started exam at around 12:15 and finished answering all the questions in 3 hours 35 minutes. I took a break then and came back from washroom after all the checkout and check-in procedures, which killed 8 minutes. In the remaining 17 minutes, I reviewed the marked questions. After the end of the exam and survey, I was waiting to see the Congratulations text to come over the screen. And, guess what! I saw the Congratulations text. A big smile in my face and a moment to remember always!